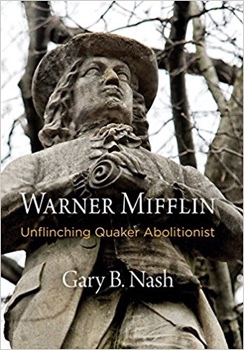 Gary B. Nash, Distinguished Research Professor, UCLA, author of Warner Mifflin: Unflinching Quaker Abolitionist (Philadelphia: University of Pennsylvania Press, 2017). But the name of Warner Mifflin has receded into the remote reaches of American memory. Indeed, almost nobody knows his name today. When the new nation was young, Washington, Jefferson, Franklin, Madison, and the other founding fathers knew him well. There was no such thing as a mid-Atlantic Quaker who couldn’t recognize the man, not just for his unusual height, little short of seven feet, but for his moral intensity that was exceeded only by his haunting fear that he would displease his God with inadequate efforts on behalf of black Americans. So did overseas luminaries of the Enlightenment know and admire Mifflin—figures such as Hector St. John Crevecoeur, famous for his Letters from an American Farmer; Jean Pierre Brissot de Warville, cofounder of the Societe des Amis Noir; the Marquis de Lafayette; and Thomas Clarkson, author of the History of the Abolition of the Slave Trade (1808). In fact, Crevecoeur opened his 1784 French expanded edition of Letters from an American Farmer with eleven pages lauding Mifflin as a consummate reformer and humanitarian. Soon he was celebrated in schoolbooks from which English children learned French, while August von Kotzebue, the most prolific playwright of the Napoleonic period, staged a play about Mifflin that thrilled theater-goers in Vienna, Mannheim, Berlin, and St. Petersburg as Napoleon’s armies approached Russia. But soon he became the forgotten man. Years ago after reading about Warner Mifflin’s appearance before the First Congress in New York City in February 1790 to lobby in support of petitions from Quakers and the Pennsylvania Abolition Society, I thought that someday time would allow me to look into this Quaker antislavery spokesman. Searching for scraps of information, I found a small mountain of material: hundreds of letters, petitions, and legislative proceedings; court records, newspaper accounts, and essays from his own pen; monthly, quarterly, and yearly minutes of the Society of Friends in Delaware, Virginia, Maryland, and Pennsylvania; and land records, accounts of his traveling ministries, and family bibles. My goal now was to disinter this remarkable man from the dustbin of history. Mifflin was the key figure bridging the first wave of abolitionists in Pennsylvania—a thin blue line stretching from the Germantown Protest of 1688 through William Southeby, Benjamin Lay, John Woolman, and Anthony Benezet—and an early nineteenth-century second wave of mid-Atlantic antislavery worthies carefully documented in Manisha Sinha’s new book, The Slave’s Cause. From the early 1780s to his death in the yellow fever epidemic of 1798, Mifflin was the most dedicated and tireless abolitionist as the American Revolution wound down and the new nation took form under the Constitution. Forgotten for his leading role as a part of the post-revolutionary Atlantic-wide abolitionist network, Mifflin has also been overlooked as the pioneer of reparations for enslaved Africans—the radical idea, with roots in Old Testament scripture, that those carried across the Atlantic in chains and consigned to lifelong, uncompensated labor had not only the right to their freedom as fellow humans but some form of restitution from the unchristian pillaging of their bodies and minds. Since the Civil Rights movement of the post-World War II era, the idea of reparations has entered political discourse, but its origins in the conscience of a handful of mid-Atlantic Quakers, as the revolutionary era unfolded, have fallen victim to historical amnesia. Providing reparations through cash payments and land as well as shared crop arrangements for his liberated adult male slaves, Mifflin preached “restitution” on the Eastern Shore of the Delmarva peninsula, making Kent County, Delaware a center of reparationist doctrine. Why did Mifflin disappear from the history books and, more generally, from public consciousness. After the Civil War even readers of Quaker journals found only morsels to remember him by. Why? War was hardly out of fashion, and Quaker peace witnessing was not out of fashion either. But a restless, violence-prone, triumphalist white-dominated America had other heroes in mind—expansionists, Indian haters, military leaders, captains of industry, and racial purity spokesmen. An inward-dwelling man who was certain that history was on his side and that God would not forget if he proved a disappointment hardly fit this mold. As boisterous nationalism, genocidal wars against Native Americans, and segregationist dicta gripped the country, he became nearly an anti-hero best left unmentioned. By the end of the nineteenth century, the history books began to level charges of fanaticism against those who continued to preach abolitionism after the Constitution of 1787—pertinacious meddling that stoked sectional discord and threatened national unity. in at bay. Dismissed as hopelessly naïve or clinically unhinged for insisting that slavery was the new nation’s Achilles heel and that the republic would not survive slavery’s continuation without massive bloodshed, abolitionists such as Mifflin were left to molder in their graves. Now, it seems, the abolitionists are getting another look.